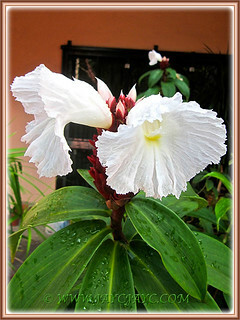 Born to be a star is Cheilocostus speciosus (Crepe Ginger)! Standing tall, majestic and dramatic in our tropical garden, it started flowering for the first time ever in two years, from early March and had been blooming non-stop ever since. 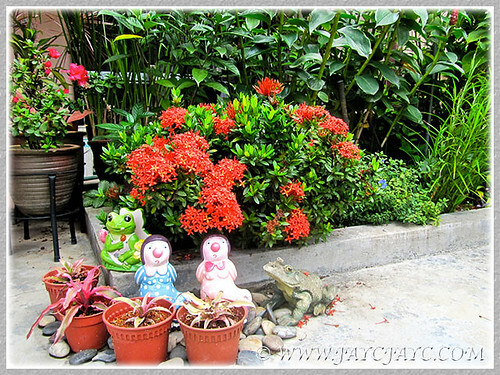 Our tropical garden, providing us our daily dose of joy… we praise and thank the Good Lord! The tall and majestic Crepe Ginger serves as backdrop for our front yard. Every morning for almost two months from March until end of April, one or two new flowers would protrude from the reddish-brown bracts to greet us. It finally exhausted itself a couple of days ago when the cone-shaped bracts reached about 10 cm in height. Even without the beautiful, white crepe-like flowers, the remaining darkish-red cone appears appealing! Another white beauty that excites us so is the Gardenia jasminoides Tabernaemontana divaricata cv. 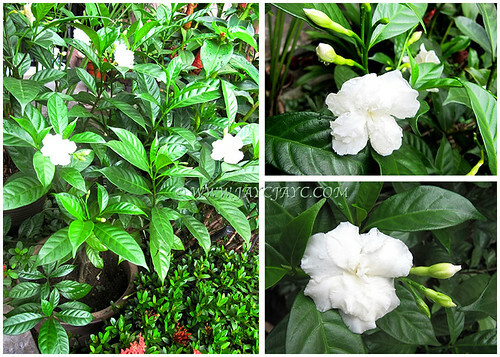 Flore Pleno (Crepe Gardenia, Crepe Jasmine). Flowering its head off with lots of potential buds! The potted plant was given a hard prune last December as most of its leaves were diseased, spotted with tiny yellow dots. Not sure what kind of sucking insects were attacking the foliage. Anyway after the haircut, it grew rapidly with a vengeance and started blooming from early March into April and marching onwards into this month. The whole potted bush is now relocated and sits in the garden border behind the Ixora coccinea ‘Dwarf Red’. It remains planted in the container as the garden bed can be water-logged during heavy rainfall. 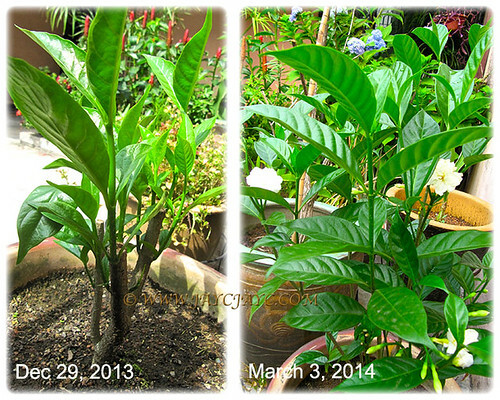 April 30, 2014: Ixora coccinea ‘Dwarf Red’ (Jungle Flame/Geranium) blooming happily after a haircut. It is a year-round cheerleader that enjoys being groomed regularly. The Crepe Gardenia’s white multi-petaled flowers and large leathery green foliage will be a charming backdrop and wonderful contrast for the red-flowered Dwarf Ixora. Don’t you think so? Callistemon citrinus (Crimson Bottlebrush) that was added to our garden last June has been a great disappointment. A lesson learnt here… never get an aged or overstressed plant that had been badly neglected and left for years in the same polybag at a garden centre, no matter how cheap and attractive the price offered! The straggly tree hardly showed much growth in terms of height and bushiness for more than nine months in spite of being fertilised regularly and given doses of epsom salt monthly. An eyesore really that nearly got booted out when lots of leaves started dropping with no apparent cause. 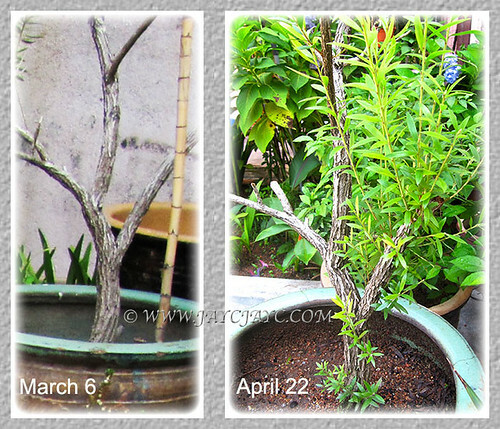 Not willing to trash it as yet since I truly look forward to see its vibrant red bottlebrush-shaped flowers, I hard-pruned two of its side branches to see the outcome. We were pleasantly surprised to observe that several new branches have emerged, and some even sprouted from the lower end of the main trunk. For the time being, I’ll allow the new branches to mature first, and later prune down the straggly main trunk too to rejuvenate growth. A first-time experiment for me… hope this is the right way to get it dense and bushy, happy and healthy, and eventually reward us with blooms. 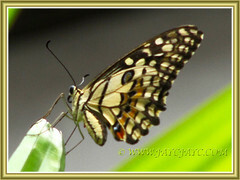 Therein are endless wonders to dazzle us! Every plant, whatever the size or colour, even a weed has a unique beauty of its own. 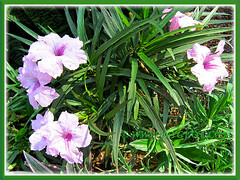 Sharing below are some of our garden babies growing at the front yard that give us great pleasure, happiness and delight! March 14, 2014: Pteris multifida (Spider Fern, Chinese Brake, Brake Fern), a most welcomed volunteer plant that self-sows at every nook and corner. Love these ferns with unique formation! March 7, 2014: Impatiens balsamina (Garden Balsam/Jewelweed) with striking orange-red flowers. Too bad that it’s an annual. We prefer perennials with less maintenance. 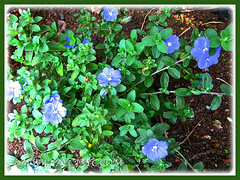 March 6, 2014: Evolvulus glomeratus (Blue Daze, Hawaiian Blue Eyes), an ideal ground cover with pretty blue flowers. 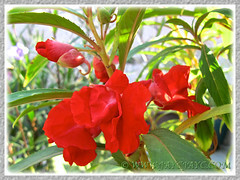 We recently planted these to replace Antirrhinum (Snapdragon, Dragon Flowers) that rotted due to heavy rainfall. 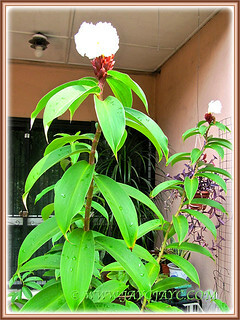 March 6, 2014: Arundina graminifolia (Bamboo Orchid) growing well and producing attractive Cattleya-like flowers. 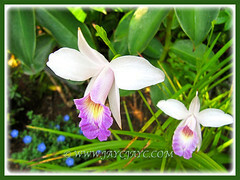 These are lovely additions to our garden since we no longer grow Dendrobium orchids and the like. 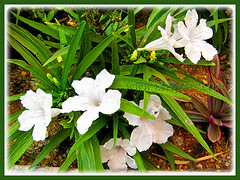 March 9, 2014: Ruellia brittoniana ‘White Katie’ (Dwarf White Bells, White Katie Ruellia, Dwarf White Ruellia) with white trumpet-shaped blooms. April 22, 2014: Ruellia brittoniana ‘Bonita’ or ‘Colobe Pink’, a dwarf variety with attractive pink flowers. 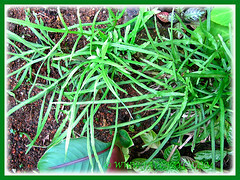 More plant info here. 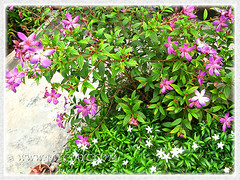 March 3, 2014: Tibouchina mutabilis, a purplish-pink cultivar (correct ID please, anyone?). Such a joy to see it happily blooming its heart out at the outer garden border. Currently, the bush has grown a little too tall and needs a prune. A chore that I do reluctantly, especially when it’s everblooming! 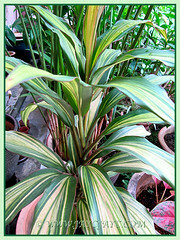 April 24, 2014: Variegated leaves of Cordyline terminalis or C. fruticosa (Ti Plant) growing steadily. Started off with an 8-inch cutting, given by a Church friend last December. 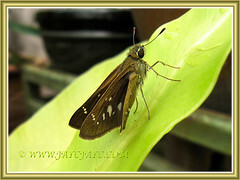 March 3, 2014: Lerema accius (Clouded Skipper) on Bird’s Nest Fern. Quite a frequent visitor to our little paradise. 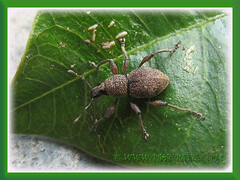 March 3, 2014: Cropped image of 1-cm-long bug on the diseased leaf, infested with soft scale insects. Is it a garden pest insect or predator (beneficial insect), I wonder? Help ID this bug please. 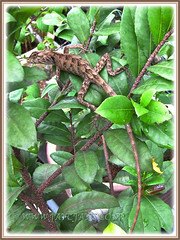 April 14, 2014: Calotes versicolor (Changeable Lizard, Garden Fence Lizard), camouflaging on the Mickey Mouse Plant. This is the first time we’ve seen one in our garden with such prominent markings… rather attractive, yah! April 21, 2014: Papilio demoleus (Lime/Lemon Butterfly, Chequered Swallowtail), resting on the frond of Lady Palm, at the backyard. 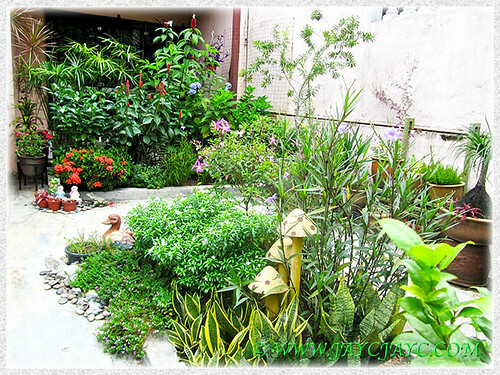 Hope you’ve enjoyed the flora and fauna in our mini garden. All the shots above were captured from March to April while enjoying my daily leisure walks or toiling away in the garden.